When designing our musical outreach program, all members of our wind quintet agreed that we wanted to work with children, particularly third graders and younger. 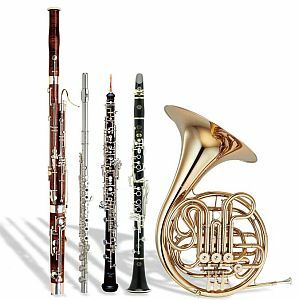 First things first, for those who may not know, a wind quintet consists of five instruments (flute, oboe, French Horn, bassoon, and clarinet). The reason we chose young children over every other demographic is because we all love working with children, and we thought this is one of the best ages to work with in order to generate lifelong interest in some of the wind instruments and repertoire. String instruments and piano tend to be the more popular choices, and we wanted to do our own instruments justice as well (though the flute is already wildly popular and probably does not need extra help). What better way than to introduce our instruments and music to a group who have unbounded and limitless curiosity?? However, this is a very difficult age group for which to plan programs, because they have particularly short attention spans. We wanted to present music that would be exciting and engaging for our classes, and one of the best ways to do this is through musical storytelling. Musical storytelling is just what it sounds like – a story told through and with the accompaniment of music. Music itself is always telling a story, but those who are not well-trained may miss some of the nuances in musical gestures, or they may feel that they are doing the piece injustice if they create their own story for it. Musical storytelling is an excellent way to address these issues and generate an interest in music. Our group decided to perform the woodwind quintet arrangement of Sergei Prokofiev's Peter and the Wolf, because it is an engaging story with beautiful, beautiful music. Many of you might be familiar with the children's story Peter and the Wolf (1936) for narrator and orchestra, which was written and composed by Russian/Soviet musician Sergei Prokofiev. The combination of the spoken story with the music significantly enhances the audience's experience (in my opinion!). For those who don't know the tale very well, it revolves around a boy , Peter, and what he and his animal friends do when trouble (caused by the Wolf) occurs in the meadow (for a more thorough synopsis, please look online! I've included a video link below for those who wish to experience the musical story). If anyone is interested in the historical context and alternate readings beyond simply a children's story (and as we know by now, most children's stories are allegories), I direct you to "Classical Reissue reviews – Prokofiev: Peter and the Wolf" by American music reviewer Gary Lemco. Lemco views Peter and the Wolf as an allegory for the political situation during the 1930s in the Soviet Union. There are two main theories – the first is that the characters represent the various Soviet republics, and the second is that the characters represent the nations of Europe. Peter, who bears the same name as the Russian national hero Peter the Great, represents Russia. In both versions of this theory, the Wolf represents the virulently anti-Communist Nazi Germany. It is certainly food for thought, whether or not you choose to apply this lens to the story! Lemco, Gary (10 May 2013). "Classical Reissue Reviews – Prokofiev: Peter and the Wolf". Audiophile Audition. Archived from the original on 23 June 2015. The very beginning of the following video goes through all of the excerpts, so please listen! If you cannot read music, try to follow along with the contour of the notes (against the video) to get a very basic idea of how the excerpts work. I encourage all to watch the entire video below in order to hear the whole story! Show the importance of storytelling through music while exposing children to classical chamber music and classical instruments. MICAH (basoon): Hello, we are from NEC’s CPP program and we have a special program for you today, but before we get started with that, we are going to play a little bit of music for you! MONA: I hope you enjoyed that piece! Today, we are here to share a musical story with you. This story is about a boy named Peter and what he and his animal friends do when trouble occurs in the meadow. MONA: What things do you need to make a story? (interactive portion: take 2 or 3 suggestions). In a story, you need characters, and in this story, each character is represented by the different instruments we play. Now, we are going to introduce each instrument to you, and play a little guessing game! BRITTNEE (clarinet): Discuss the concept of ensemble, use the sports analogy of working together like a team. When one person has the main theme everyone else supports them (like the quarterback). We pass the melody between each other like we’re passing a ball. Put hats on and play Peter theme (play theme together) + interactive: ask them to move their arms as if they are skipping. BRITTNEE: Now we have a special surprise for you, so close your eyes! (Put on costumes). Now I'd like to introduce you to our narrator, Ms. Maggi. Play music, Tanya narrates the story! Note how we work as a team to make music TOGETHER!! Knowing the specific age groups allowed us to tailor our program to fit each school. For example, on Tuesday, April 5th, we had two assemblies (one for kindergarten and one for first grade). While we had already condensed our music to make it fast-paced, we cut even more material from our music for the kindergartners (some repetitive sections with the hunters parading about) so they would not get bored with some of the "slow paced" sections. However, we were able to re-include these sections for the first graders, because they can concentrate for slightly longer periods of time. Our goal was also to talk as little as possible, while still transmitting enough information, to keep our program highly interactive, and to be excited and positive so that we could encourage excitement in others (it is contagious, after all!). As we were a school formed group, we stayed together all year long, devoting two nights per week for rehearsals (roughly 1 - 2 hours in length each). For several months, a large portion of this was devoted to learning Peter and the Wolf, which is deceptively hard. We had one coaching each week with a member of the NEC faculty. As a result, my chamber group and I spent a lot of time together. Perhaps even more valuable than learning how to design a program, I learned how to work with people on a very intimate level (which included navigating disagreements). To this day I marvel at how music can bring people so close, nearly to the point of being a (sometimes) bickering family. I certainly feel closer to the members of my wind quintet than I do to anyone else at NEC! Creating chamber music is much more difficult than playing solo repertoire or performing in an orchestra. Peter and the Wolf is difficult, and it seems like we should have performed 100 concerts for the amount of work we put into the piece. Planning a program is not too difficult, but it requires a lot of alterations. Don't get too attached to your original ideas and goals; embrace change! Performing the program can be difficult and exhausting, because you have to discern the mood of the audience WHILE playing. There are so many creative ways to use your musical skills; you don't have to be limited to being a performer or a teacher only. I have learned a lot about respecting my peers this semester, and also about how to share my love of music with others.. If you're having fun, the children will have fun, too! Despite the amount of professionalism that went into this, it's okay to be a little silly and show your audiences that music isn't "stuffy". More than anything else, I discovered another opportunity to stay true to my musical goals, as well as find ways to come to love music again (and even more!). Thank you for a wonderful year of music making - to my quintet, and to all the schools who were generous enough to host our visits! Stay tuned...the following photo carousel will be updated with more pictures of my quintet's adventures this year!